Counting the playoffs, the Chargers went 13-5 in the 2018 season, bringing the franchise’s all-time record to 459-460-11. Basically, if the Chargers had made the Super Bowl, the team would have an all-time winning record. Over the last 10 years, things have been better. 2009 marked the last of a four-year run atop the AFC West, and they haven’t made it back since, but the team does have five second-place finishes and two playoff appearances since. Their 12-4 record a season ago would have been a first-round bye most seasons. And through it all, there has been continuity. The Chargers have had the same quarterback (Philip Rivers) and No. 1 tight end (Antonio Gates) since well before our 10-year sample starts. Gates might be on his way out, but that quarterback … who knows how long he’ll be going strong. Let’s take a look at the best Chargers fantasy seasons of the last decade. What, you were expecting Billy Volek? Rivers is the only quarterback in the Chargers’ last 10 years with more than 32 pass attempts, and Volek and Kellen Clemens are the only two with more than four. He easily has the highest percentage of a team’s pass attempts in those 10 years, and while 2013 was his best season, he’s had four seasons with 10 points of that and has topped 250 points nine times. The point is, Rivers isn’t the best quarterback in the league, but he’s the most consistent. 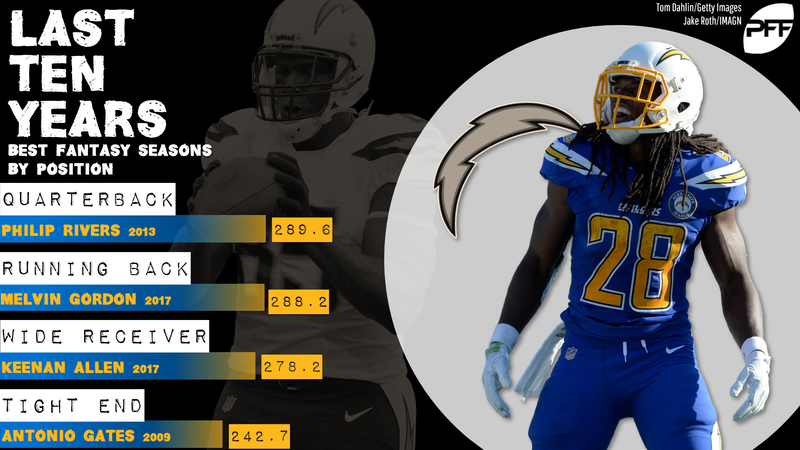 With the LaDainian Tomlinson heyday largely coming before our 10-year sample began, it’s Gordon holding down the top three spots on the Chargers list. Had he not missed four games in 2018, that would be the year winning things, but as it is, his lone 1,000-yard season (so far) carries the day. Not bad for a back who managed 3.5 yards per carry, 0 touchdowns, and 7.7 PPR points per game as a rookie in 2015. Allen’s career: Great rookie season in 2013, injury-plagued 2014, injury-plagued-er 2015, injury plagued-er-er 2016. People were losing hope for the extremely talented receiver. Which is why his return to prominence in 2017 was that much more exciting than a mere good season. He topped 100 receptions, played all 16 games, won Comeback Player of the Year. And he brought it back in 2018 with a season that was almost as good. We can retire the “injury-prone” moniker and just look at Allen as one of the league’s elite. It’d be a surprise if Gates came back for another run in 2019 after waiting until nearly the start of the season to sign in 2018. He turns 39 in June and just had arguably his worst season, and with Hunter Henry expected back and healthy, the Chargers don’t need the veteran like they did a year ago. Still, Gates was a big producer for a long time (he’s been with the Chargers since 2003), and while you can argue whether 2009 was his best season — it included his career-high in yardage but he’s scored more touchdowns six different times — it was tops for fantasy. See ya around, old man.